Two-directional Portable EZ-Borehole Profiler (IQ-BORE) is designed for magnetically clean applications and includes SOLID STATE advanced Pitch / Roll / Temperature compensated miniature compass system. It is built around a state of the art Cortex microcontroller utilizing AOSI's proprietary algorithm on a 0.9" x 2" x 0.5” assembled PCB. 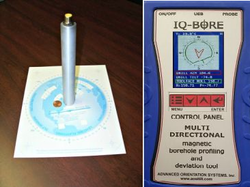 IQ-BORE system includes 1.5” diameter 18.5” long IQ-BORE probe, color handheld display controller and cable. The new directional IQ-BORE probe is able to provide total borehole profile information. The IQ-BORE displays borehole and tool face directions, X-Y-Z magnetic fields, borehole pitch, tool roll and temperature in its integrated handheld controller. The handheld display controller includes a color display, four touch keys in a soft rubberized case. The system is powered by a single 9 Vdc cell. Advanced Cortex processor monitors all communications with the IQ-BORE probe, sends and receives user commands and displays graphic and numeric data on the screen. All displayed data is in real time. The system also includes special reinforced abrasion resistant cable. Due to the systems modular construction the cable is available in various standard and custom lengths and marked depth increments of "1ft, 5 ft, 10 ft, 1m, 3m, 5m". .
IQ-BORE can profile both VERTICAL as well as HORIZONTAL boreholes; therefore there is no need to have two separate borehole deviation probes (one for each orientation). The user does not need to retract the probe or go through prolonged setups and re-calibration procedures in order to switch between orientation modes. As IQ-BORE senses the real time direction of the borehole, there is no need to install borehole casing, resulting in IQ-BORE operating in holes with casing and without. Super flexible cable facilitates secure gravitational resting orientation of the probe against the interior wall of the borehole before each reading. Looking for Digital Compass ?